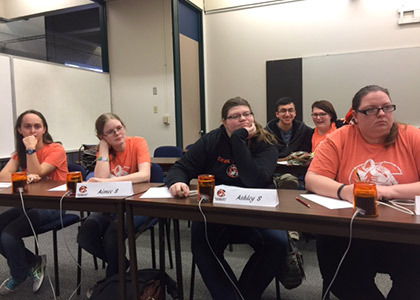 The Cowley College “A” team went unbeaten while placing first at the KAEC Regional Tournament held Saturday, March 4 at Allen Community College in Iola, KS. Both the Cowley “A” team and Coffeyville went 5-0 at the tournament. However, Cowley scored 2,120 points in its five matches compared to 1,930 for Coffeyville. Daltin Brock was the top individual finisher for the Cowley “A” team as he placed second at the tournament. Fellow “A” team member Chase LaPorte placed fourth, while Harvey Baker (10th) and Jesse McCabe (25th) rounded out the “A” team members. “I had a great time prepping for the state tournament with competition from schools in our region,” LaPorte said. Cowley and Coffeyville will be able to face off at the 2017 KAEC State Championship at Kansas Wesleyan University in Salina on March 31 – April 1. “We hope to regain our first place ranking and bring home the Silver Cup as we did in 2015,” Cowley AEC team sponsor Dianne Flickinger said. Last year the Cowley “A” team finished in second place at the KAEC State Championship. Cowley B team member Aimee Schwintz, the granddaughter of retired Cowley employee Larry Schwintz, exhibited significant progress when she ranked fourth place individually out of 36 students. “She will provide excellent leadership next year on the “A” team,” Flickinger said. Ashley Simpson, captain of the Cowley “B” team, gave her best performance yet scoring four tossups. “I had a great time learning as well as getting prepped for the state tournament,” Simpson said. Dana Risley (20th), Edgar Fuentes (27th), Symantha Shelton (tie for 32nd), and Claryssa Weis (tie for 32nd) rounded out members of the Cowley “B” team.